the day with some good friends. Hope you all have a lovely day! Happy birthday, enjoy the celebration!! Love the pleated skirt <3 Happy birthday! Happy Birthday lady! you look very pretty and the colour of that skirt is just so gorgeous! Love your style - everything in this outfit fit perfectly together! Pretty girl! Have a lovely and wonderful birthday, sweetheart! Happy Birthday! Such a cute outfit; I especially love the shoes. beautiful colours ;) and this red lipps - sooo great! Happy birthday !!! I love your shoes, I love your skirt... I think I love the complete outfit. Enjoy your day and the coming year. Hope your day is amazing! Happy birthday! I liked that a lot! happy birthday !!! Love your outfit ! Happy Birthday! Hope you have an amazing day! A big happy birthday to you! I wish you many more and hope you enjoy love! Adore your skirt btw. Love the color of your skirt! Very pretty =). Happy Birthday! Flawless as always, you really are a stunner, Bonnie! Hope your birthday is marvelous! You look lovely! I wish you a really happy birthday! The colors of the blouse and skirt are so pretty together! Happy birthday! 23 years old! I would like so much to be 23 years old, too, but it was a long time ago for me. Hope your birthday was as chic as you are ! AMAZING STYLE !! Love all your bags as well ! Happy birthday pretty lady! I love the color of your skirt and those great boots! Enjoy your day! aww i just stumbled upon your blog and it's so lovely! Have a wonderful birthday! Hope its a great one! BTW: I love your boots! Hope the next year is totally magical for you! Ey dear!!! !Happy birthday to you!!!!!! I hope you have a nice day.kisses. It's also my birthday today as well! Happy Birthday doll! Happy birthday, Bonnie! Enjoy your day!! happy bday! lovely outfit, darling! Happy birthday...23 is a great age! It sounds a little more worldy wise than 22 but not quite as mature and heavyweight as 24 :) Have a wonderful birthday! Happy birthday! Wherever it is that you live looks beautiful, your photos always have the best backgrounds! I want your shoes! p.s. love the shoes! i have the same pair but in brown - aren't they the best?! hope it is full of love and great fun! I love that skirt, how beautiful. I love the color combo here. happy birthday, you look adorable! happy birthday! that skirt is lovely on you! Haffy birfday!!!! <3 You even look a little older in these photos!! (In the best - you're a gorgeous woman, way!) Welcome to your early twenties!! Its fun, trust me :) You're a little 1988 baby! Enjoy surprises! That's the best part of birthdays :) And make sure to celebrate your birthday WEEK! HAPPY BIRTHDAY! love your skirt as well! Oh gosh, what gorgeous colours together! happy happy birthday:) love those shoes so much! 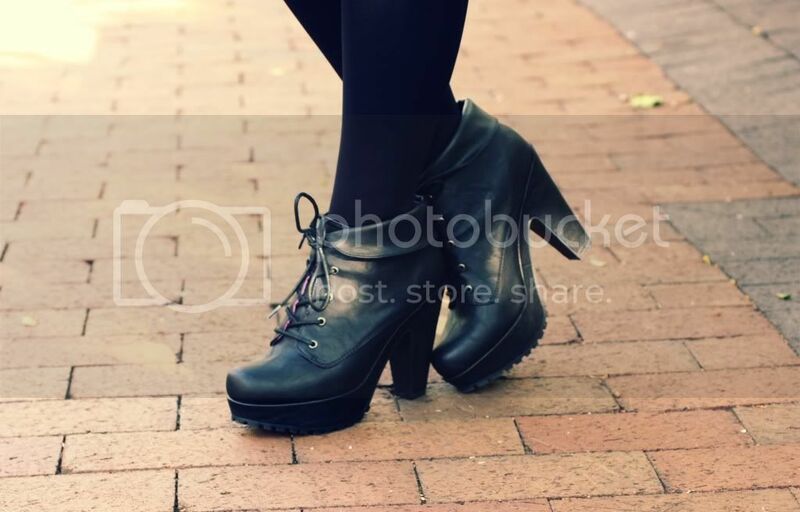 I'm on a hunt for similar ones but with a lower heel. I can't handle being in high heels for longer than like 20 minutes! HAPPY BIRTHDAY! You look amazing, I hope you have an awesome day. Happy Birthday! Love your blouse! join my halloween giveaway! WIN a BAG, SHOES and CHOCOLATES from Paisley CLothing! 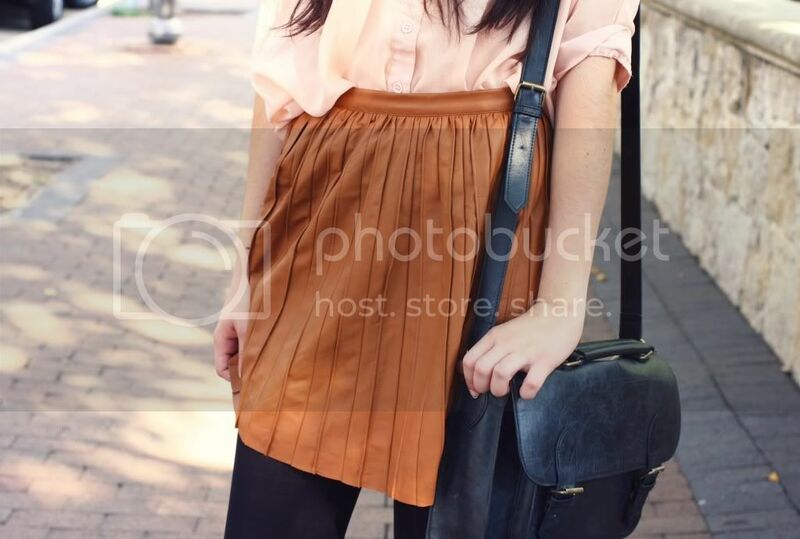 Love the skirt and blouse together...such a nice color combo! Happy birthday! All the very best!!! happy bday :))) love the outfit!! 1. Gorgeous, as always! I love the simple-shirt-and-pleated-skirt combo (or maybe that's just because I have an unusual obsession with pleats). 2. It's my birthday on the tenth! A day after yours! Hope you had a wonderful birthday!!!! Your outfit is so cute :) I love your boots! you look fabulous love the colours! Congratulations, Bonnie! You look beautiful as always. happy belated birthday! cute outfit love the skirt! a little late, but still wish you the best year! happy birthday! I love your shoes and you are absolutely stunning! Please follow me if you're not already. I'd love to get more followers! I'll follow you back. I already wished you happy birthday on Facebook and on the phone and I know this a day late on the blog but I wanted to say it again...HAPPY BIRTHDAY BEEBS! Happy Birthday! Love the outfit! So cute! Happy belated birthday! 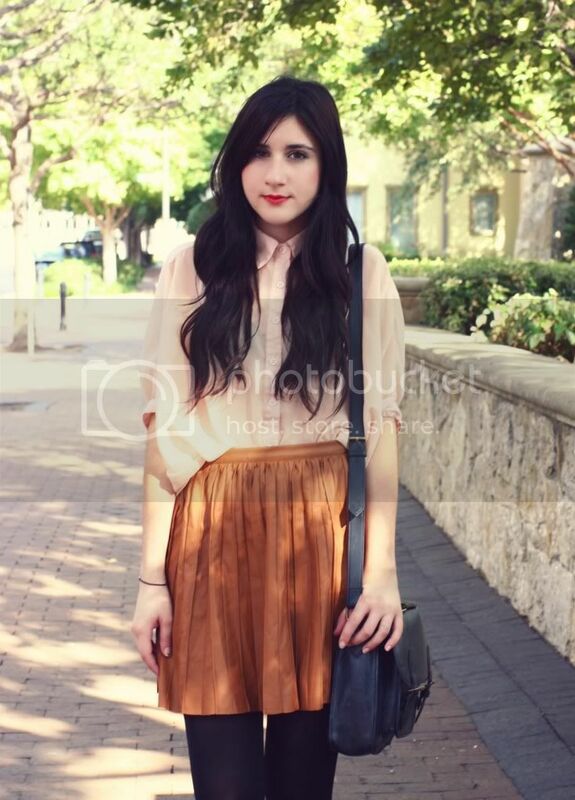 I am in love with your outfit - the blouse and skirt are beautiful. happy birthday bonnie! 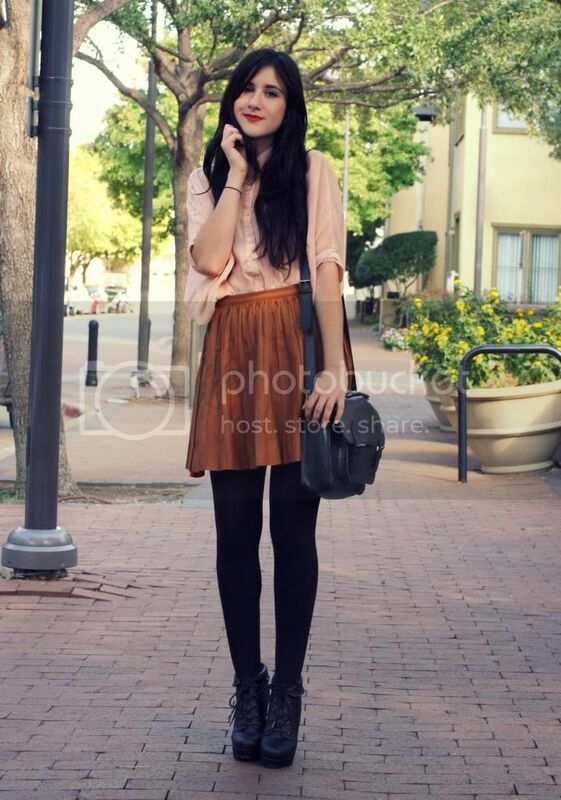 oh my I love your blog and your outifit soo soo much! You look wonderful! Happy Birthday! happy belated, my dear ! 23 is the perfect age. wish i could relive ;) have the perfect birthday week. or month ! you're right. time flies too quickly to not celebrate a birthday for an entire month. You look stunning ! I really like your skirt and your shoes add egdyness to the outfit ! Happy belated beautiful gall :) Wishing you a fun filled year & may all your wishes begin to come true! What a lovely blog you have here. The pink shirt with that skirt is a heavenly combination. Love the fall color scheme going on, that mustard skirt is gorgeous paired with that blouse. Sweet look ! Happy belated birthday! Love this outfit. Gorgeous neutral tones. Love the skirt especially! What a beautiful outfit! I love your skirt and shoes! I have the same shoes - aren't they sooo comfy?? I'm in love!